Bring the magic of the wizarding world of Harry Potter to your next party with these 30 amazing Harry Potter party ideas we’ve rounded up for you. 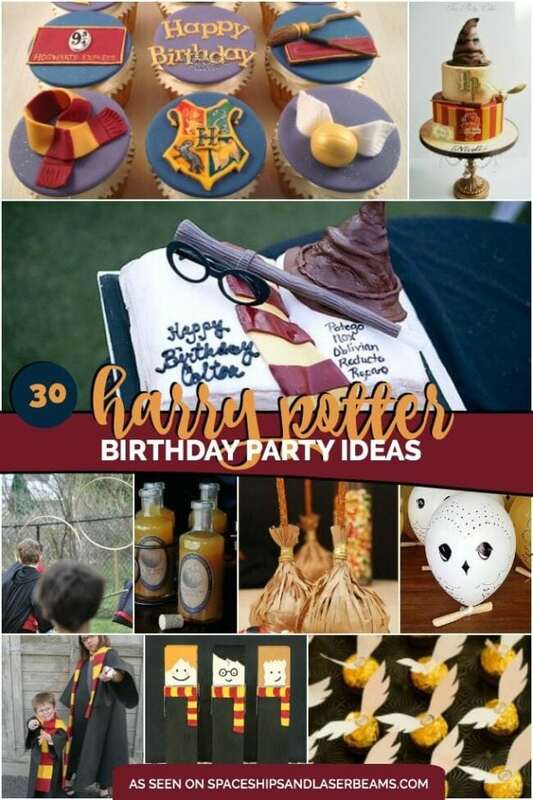 There are ideas for easy DIY table Quidditch, tutorials for making your own Snitch cake or cake pops, a variety of awesome recipes for things like Butterbeer and pumpkin juice, and plenty of game and activity ideas. We love the tutorials Snape’s Slime and Ollivander’s apprentice wand. You are sure to have a magical time! 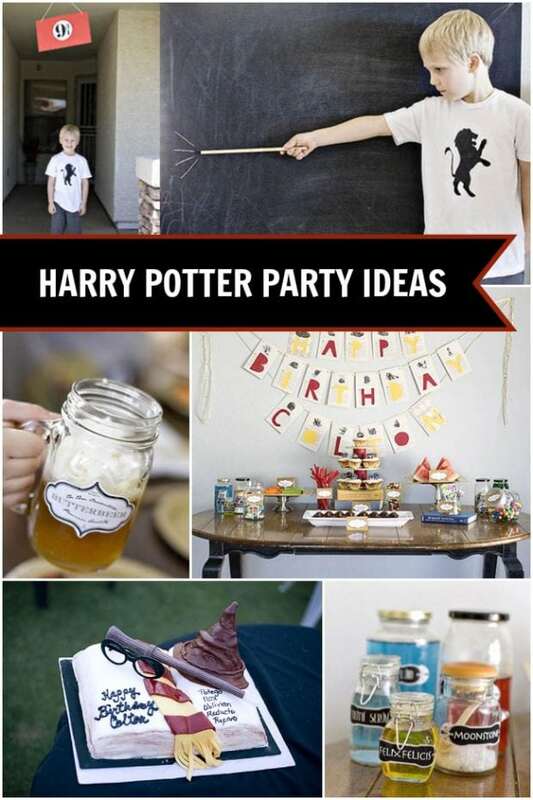 You’ll adore these Harry Potter birthday party ideas. Who knew sand, sewing hoops and empty soda bottles were actually an easy DIY table Quidditch game in the making? This is a quick DIY with only 3 quick holes to drill in dowel rods, minimal assembly with a hot glue gun, and some coats of gold spray paint. 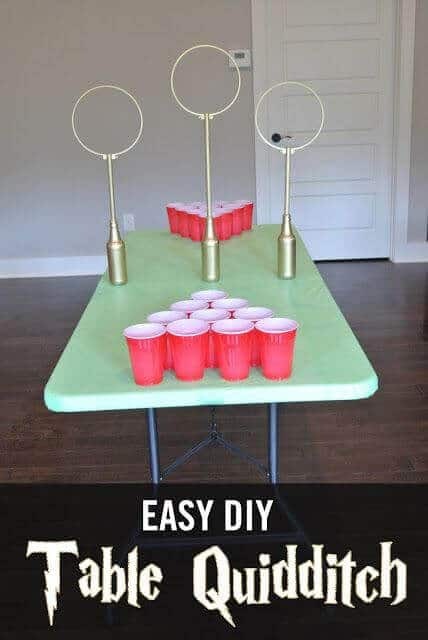 This is the Harry Potter party spin on Beer Pong (but Butterbeer would make a magical substitution). If you’ve got time and some cake decorating talent, this Harry Potter Snitch cake tutorial is awesome! 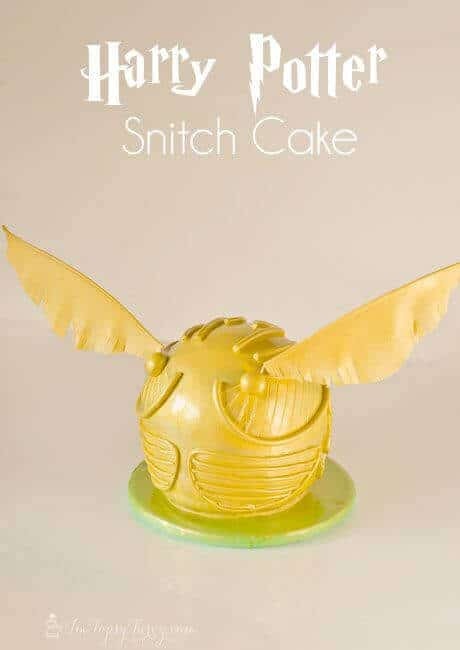 It features the use of a ball cake pan, a ganache “gluing” technique and lots of fondant piecing, plus airbrushing a golden look to the Snitch cake! A Harry Potter party lends itself to a magical invitation! 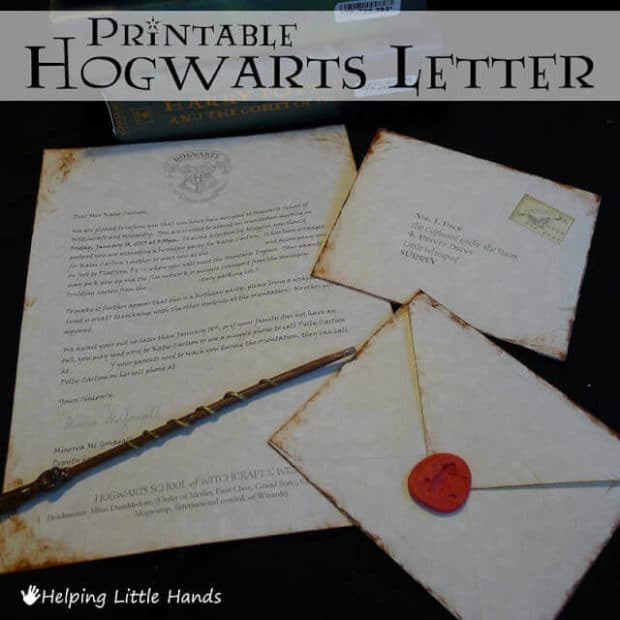 You’ll love this customizable and printable Hogwarts acceptance letter that doubles as a party invitation! So many fun touches are included, like Professor McGonnagal’s signature, the Hogwarts crest, and ideas for distressing the envelopes in which they are sent. 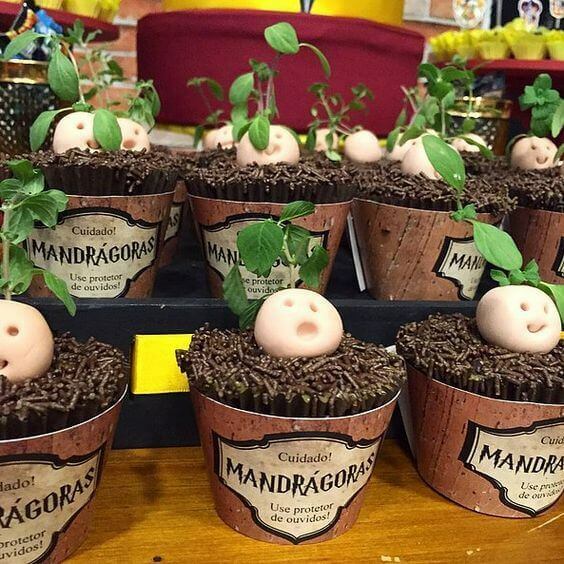 Guests at a Harry Potter party will love the nod to Herbology Class when seeing these Mandrake cupcakes. These cupcakes look like potted plants, but are really cupcakes frosted in chocolate and sprinkled with chocolate nonpareils, with the addition of a fondant Mandrake inspired head and a piece of edible plant. Take the guesswork out of your Harry Potter party by purchasing this printable Harry Potter birthday invitation! 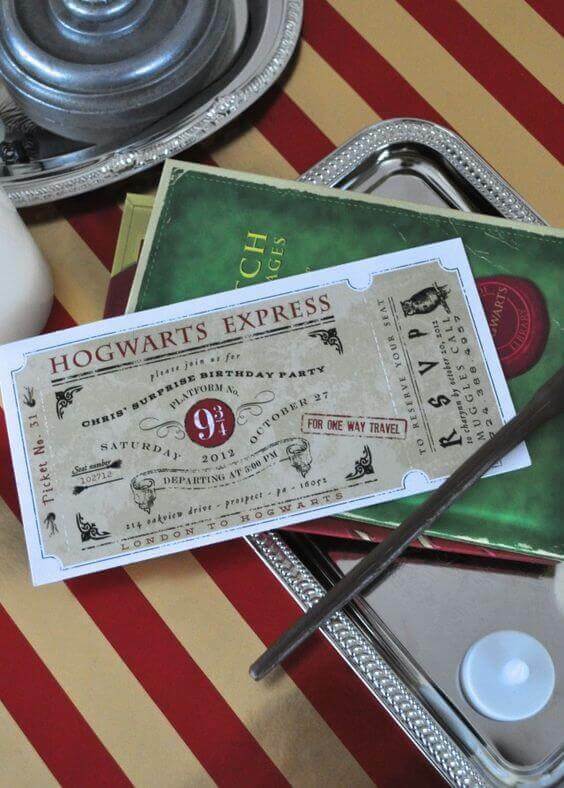 It is designed to look like a ticket for the Hogwarts Express, but is customized with all of your party details. 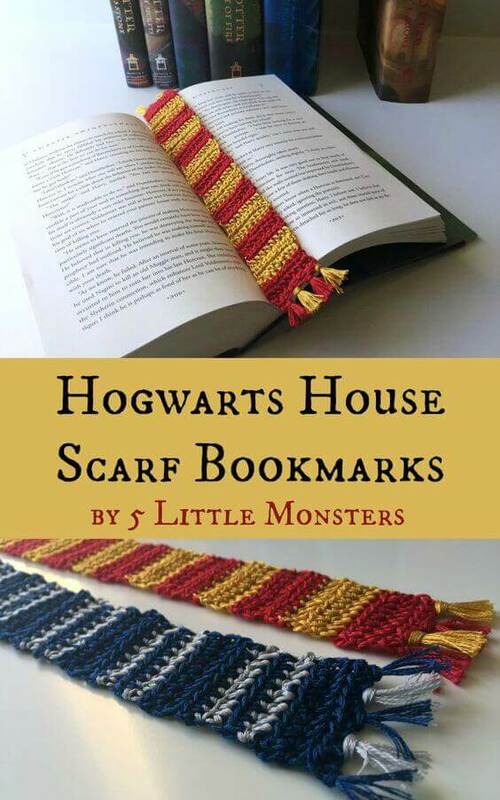 Send your Harry Potter party guests home with their own Hogwarts house scarf in the form of a bookmark! This simple and inexpensive DIY crocheting project requires 2-3 skeins of embroidery floss in each color, a D crochet hook, a needle for weaving in ends and scissors! I’m not sure what I love most about this Harry Potter soaring candle DIY – how easy it is, the fact that it uses recycled paper towel rolls, or how cool the end result is! The actual candle light is from battery-operated tea lights attached to paper towel rolls that have been waxed with hot glue and painted over with white paint. Hang them with fishing line, and they appear to float in mid-air! Think how cool these would look in your own party version of The Great Hall! 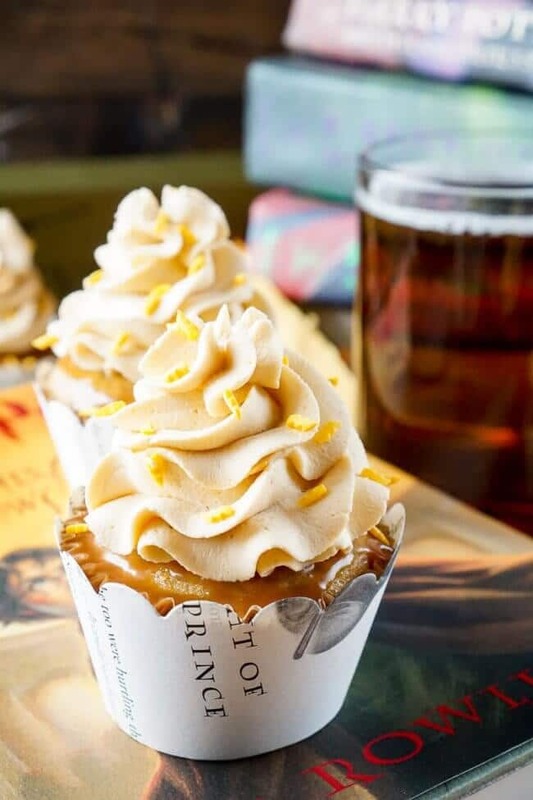 Cast a spell on guests’ tastebuds with these Harry Potter Butterbeer cupcakes that taste like a cross between French toast and Butterbeer! Hello, the recipe calls for toffee bits! And the cupcakes have lightning bolt sprinkles! They sound magical to me! 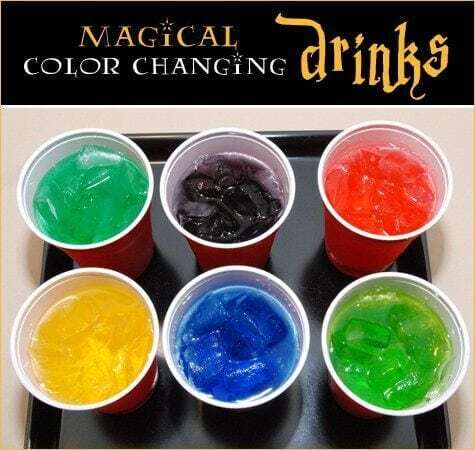 Prepare to amaze party guests with these magical color changing drinks! They will stare in disbelief as they watch their clear soda (or water) magically transform into a colored beverage! Only you will know that dried food coloring was hidden at the bottom of each cup! Add ice to the cups just prior to serving to hide the dried food coloring at the bottom. Watch as eyes widen when the clear soda is poured and fills the cup with a colored beverage instead! Don’t throw out those cardboard boxes just yet! 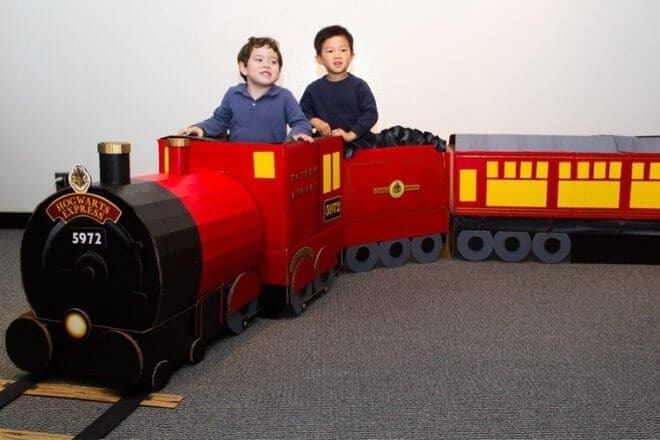 This DIY cardboard replica of Hogwarts Express might just inspire you to create your own. You’ll just need a little creativity, some time, a box cutter, paint and adhesives to get you started! What a fun addition to a Harry Potter Party! 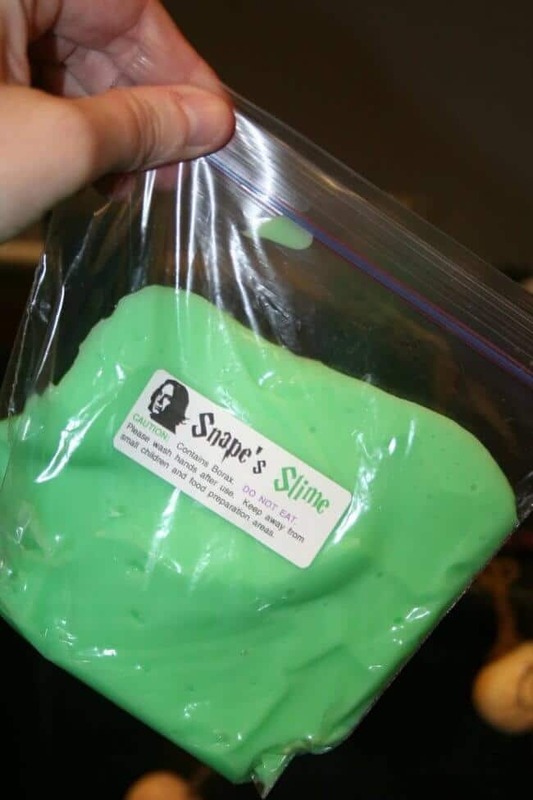 Add a “Snape’s Slime” label to a Ziploc baggie, and lead your party guests in making slime in Potions class. It’s just a simple water, Borax and white glue concoction that is tons of fun to make. A drop or two of green food coloring gives that green tint to the slime that seems a little eerie. 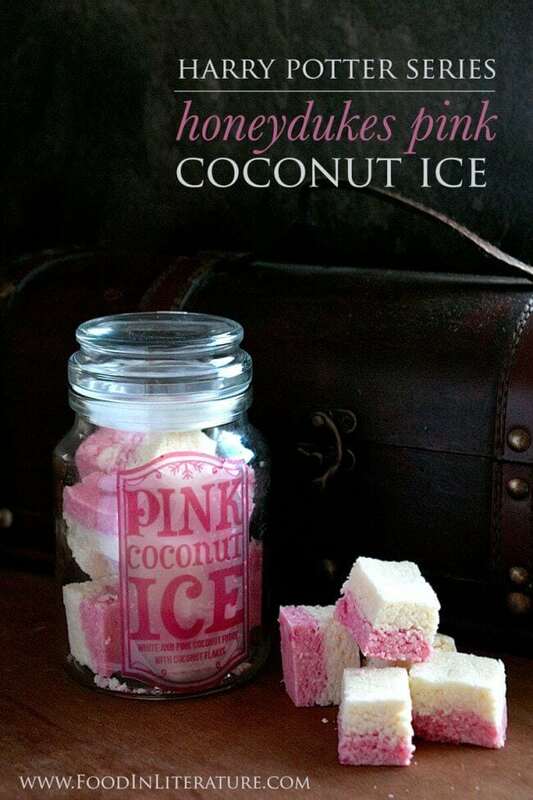 Bring in the magic of Honeydukes sweet shop with this no-bake Pink Coconut Ice recipe. It only calls for mixing up a few ingredients and a few hours of chill time in the fridge. 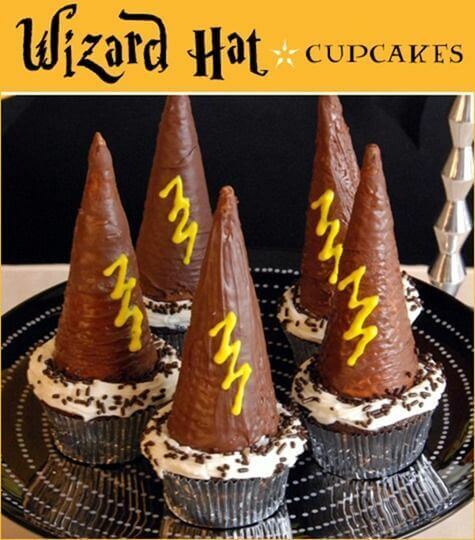 A fun alternative to traditional cupcakes, these wizard hat cupcakes definitely fit with a Harry Potter party theme! It’s an easy DIY dipping ice cream cones in chocolate, followed by piping the lightning bolt scar on each cone with yellow icing. 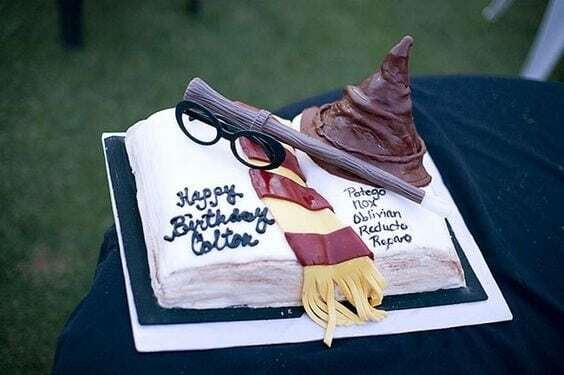 You may need to pull out your own magic wand to conjure up the skills to make this Harry Potter cake. Check out the incredible Gryffindor House scarf, edible sorting hat, and Harry’s wand and spectacles props. 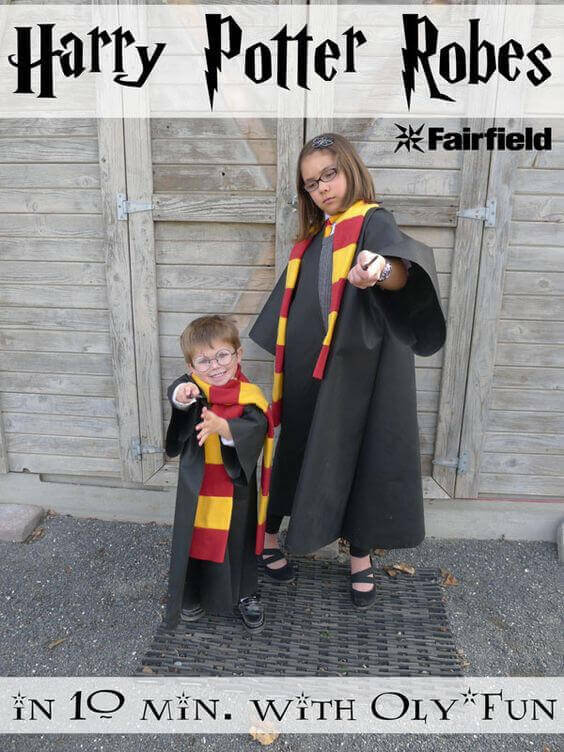 This Harry Potter birthday party will definitely inspire you! It’s full of DIY details like a handmade Platform 9 ¾ brick wall for party guests to run through! You’ll see ideas for running your own Potions class and conducting a Harry Potter wand making activity too! 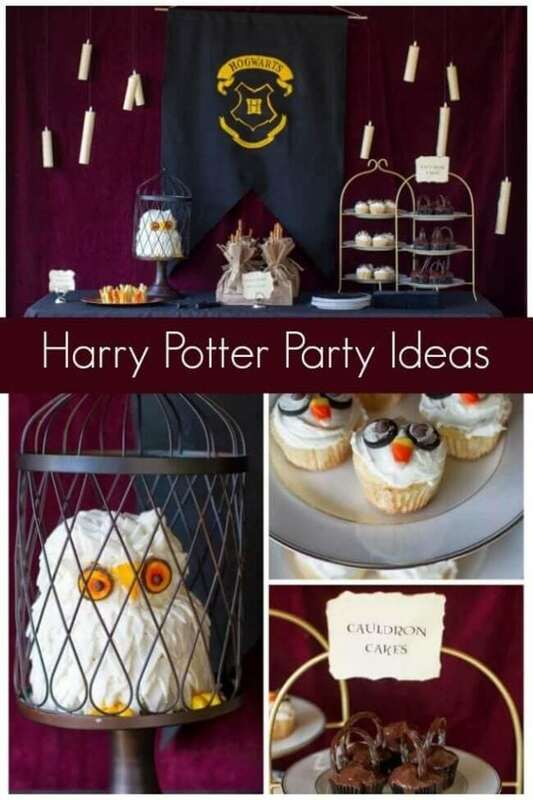 Plus, check out a Honeydukes sweets table, a caged owl cake, and the owl cupcakes. 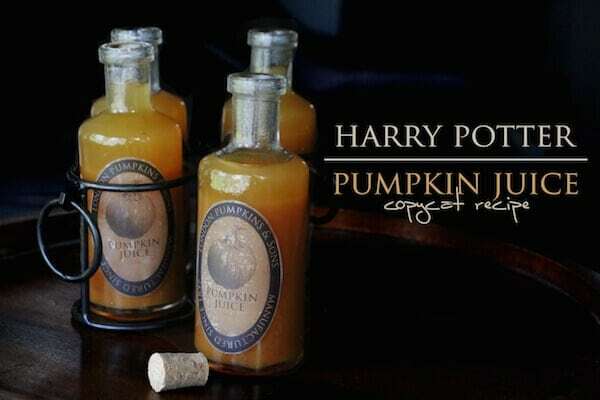 With this recipe, you’re armed with the secret formula for making your own Harry Potter pumpkin juice! Download the free Harry Potter Pumpkin Juice labels and dress up your beverages for a more authentic look. 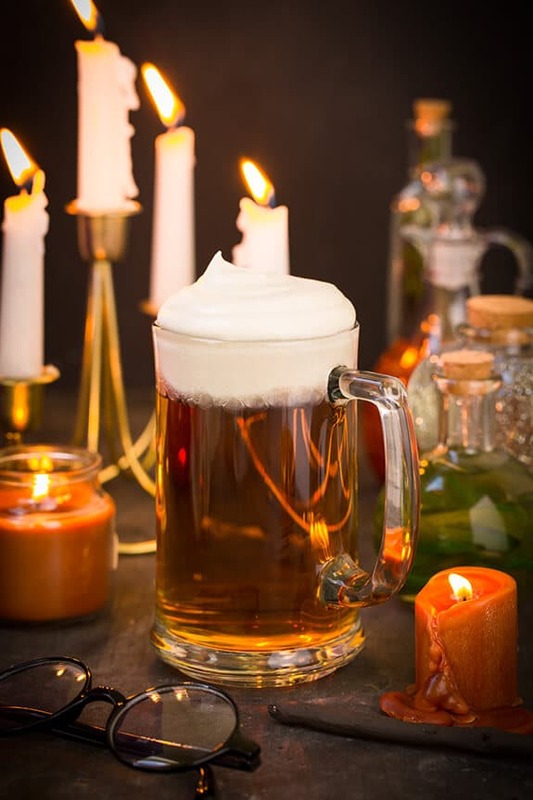 Bring all the kids to your Harry Potter party with this Butterbeer recipe! It’s a simple recipe that just requires adding some flavoring to cream soda and whipping together some heavy cream and marshmallow cream for the Butterbeer topping. This may be the easiest and most genius tutorial ever for creating Ollivander’s apprentice wands! You’ll need chopsticks, a hot glue gun, craft paint and sealant spray! You’ll be using the hot glue to add texture and character to the wands before adding a coat of paint and antiquing each wand! When the wands are perfect, you’ll spray each with a coat or two of sealant. 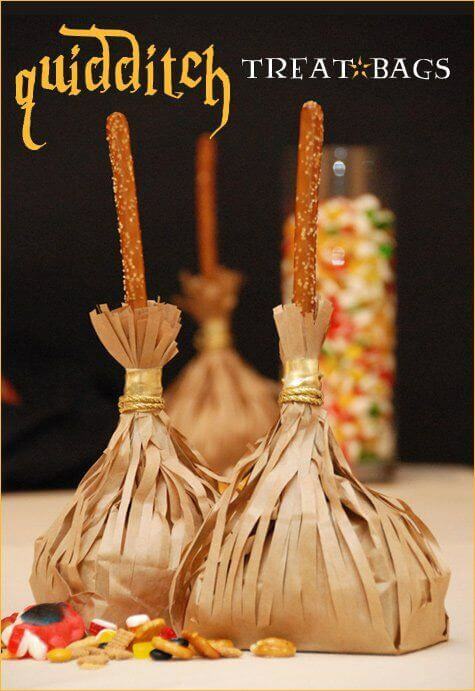 Harry Potter party-goers will enjoy this magical twist on a classic party game! 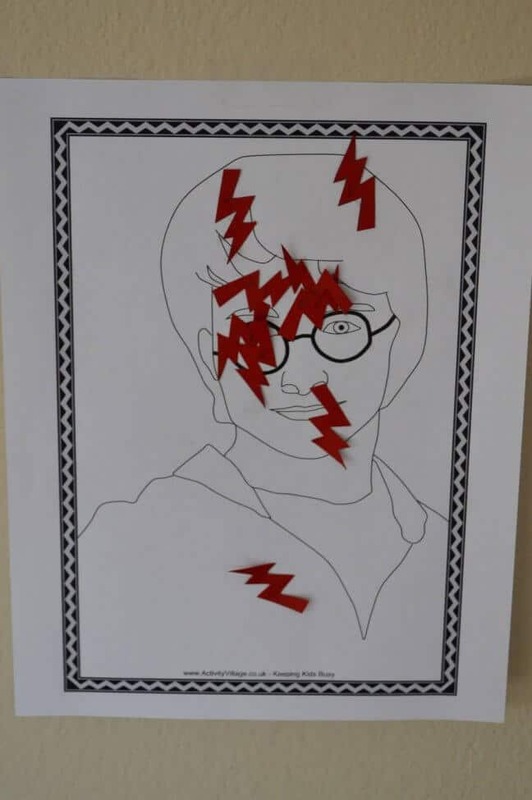 Pin the lightning bolt scar on Harry is an easy DIY! Just print out a black and white picture of Harry Potter from the internet. Cut out lightning bolts for “pinning” on Harry. This Harry Potter robes tutorial is awesome and comes with a simple sew and no-sew option! In addition to black material, you’ll need scissors and either a low-temp glue gun and glue sticks (no-sew) or black thread and a sewing machine. 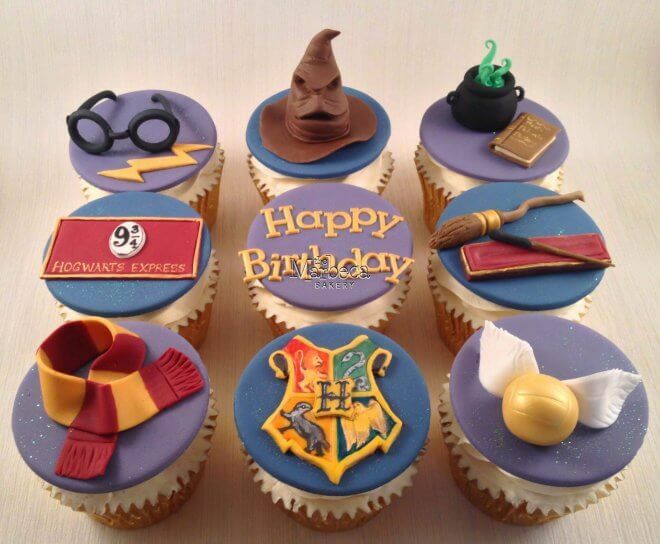 All hand molded and hand painted, these Harry Potter cupcake toppers will rock your Harry Potter party world! Skills with fondant are definitely needed to replicate these beauties! Need a quick and easy treat for your Harry Potter party? 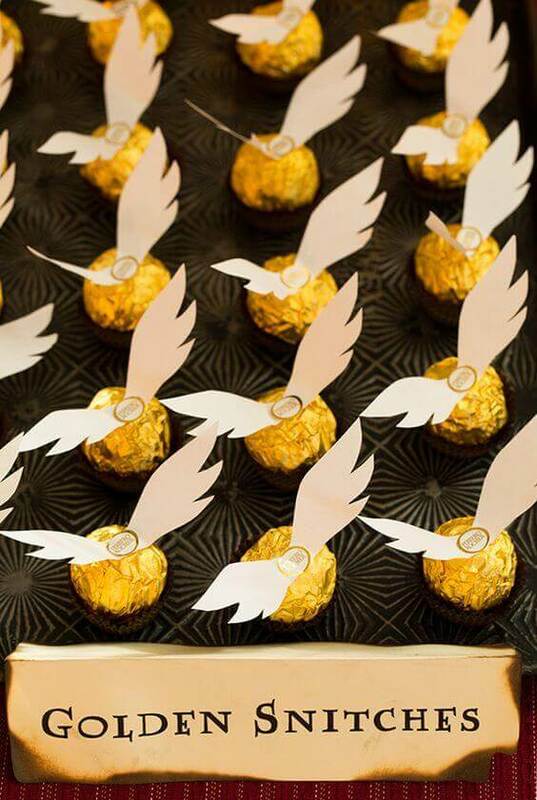 These Golden Snitches are made from Ferrero Rocher chocolates! The round truffle shape, covered in a gold foil wrapper is the perfect Snitch shape. Just hot glue on some white paper wings, and you are golden! 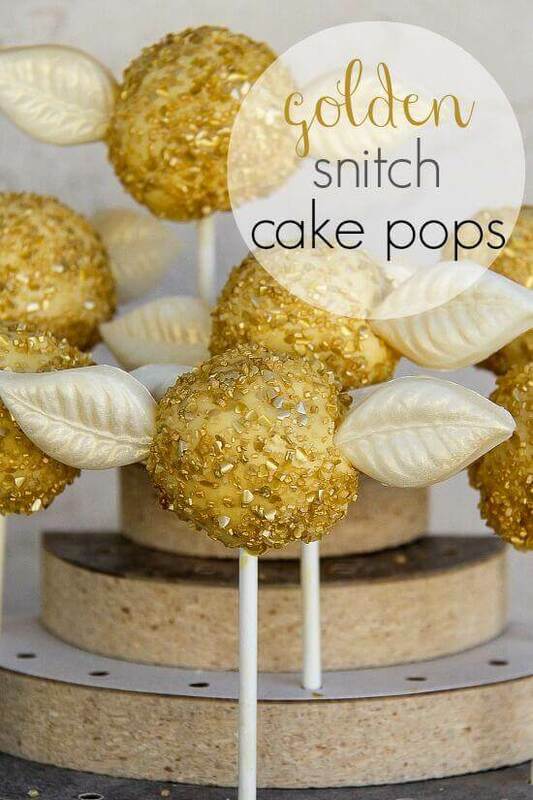 Round cake balls coated in yellow candy melts and covered in gold sprinkles are the start to some awesome edible Golden Snitch cake pops! Just add white candy melt wings made in a leaf candy mold that are sprayed in Wilton’s Gold Color Mist! 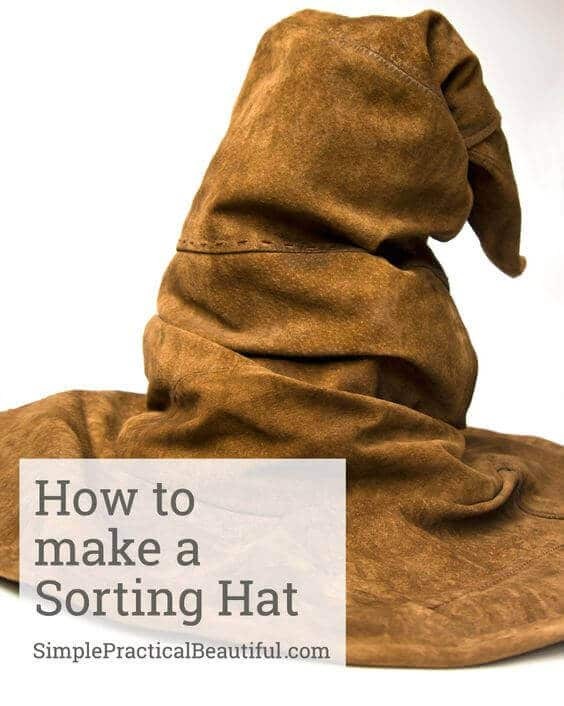 If you enjoy sewing, you may want to DIY your own Sorting Hat and hold your own Sorting Hat Ceremony to sort your Harry Potter party guests into their appropriate houses. This tutorial will walk you through making a hat out of thrift store leather jacket, and 20 gauge plastic coated steel wire. 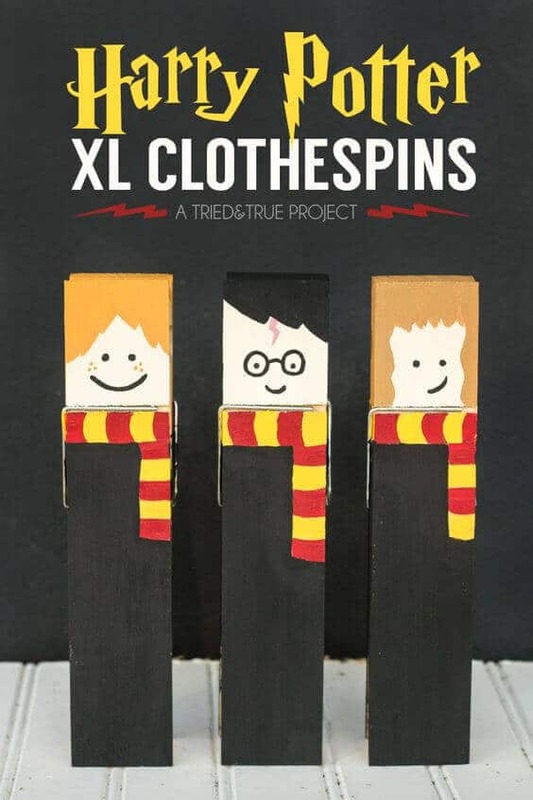 You can put together these Harry Potter clothespins as a fun send home favor with only a few supplies! You’ll need XL clothespins, acrylic paint and a pencil (for sketching your design). Kids will love finding their favorite use for these cute characters. 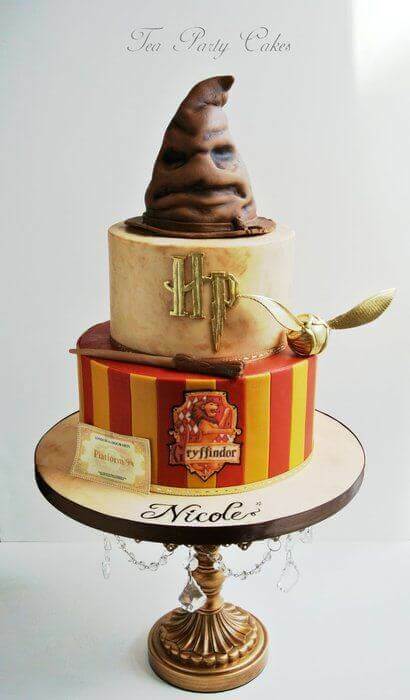 Get ready to have your socks knocked off by this Harry Potter Cake. A 6” and 8” cake are covered in fondant and topped with a Sorting Hat made out of Rice Krispie Treats. To create the Snitch, gum paste wings were attached to a fondant body. The train ticket and crest are edible prints! 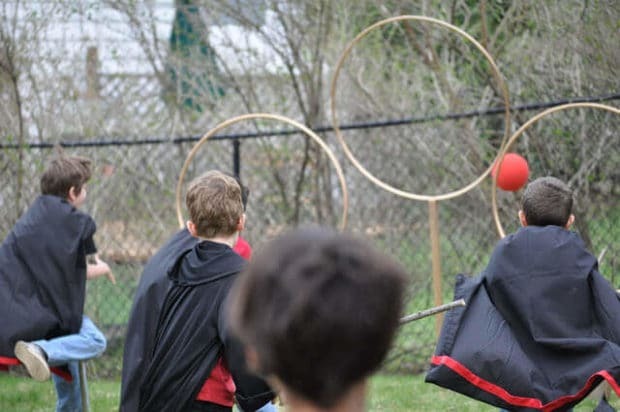 If you’re hoping to include a Quidditch game for witches and wizards to enjoy at your Harry Potter party, it’s an easy DIY project! Spray paint 3 hula hoops gold and nail them to yard stakes. Use a red ball as a Bludger and a gold painted golf ball as your Snitch. 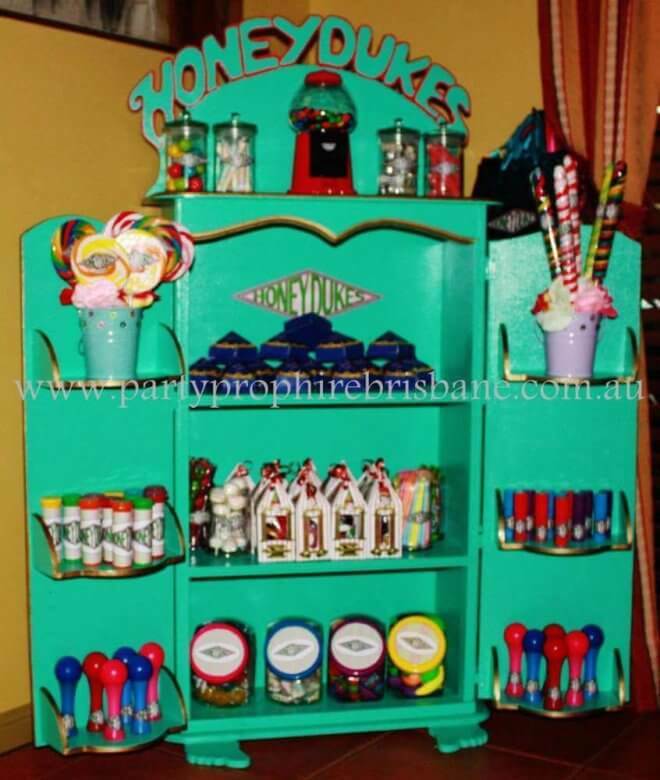 Upcycle an old bookshelf to create a Honeydukes inspired candy display. Fill shelves, apothecary jars and candy jars with a variety of sweet treats inspired by Harry Potter. 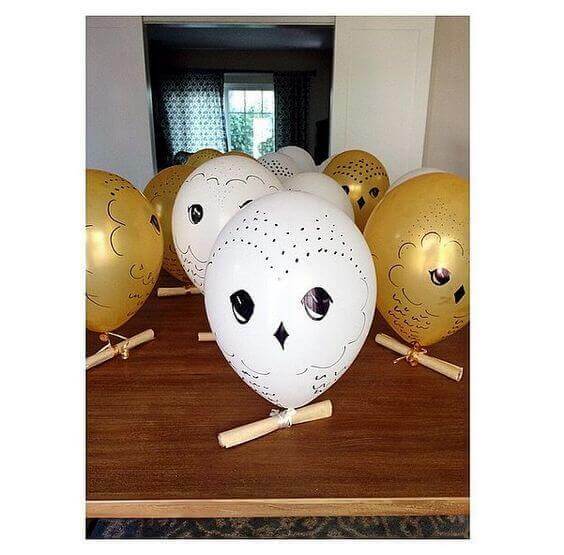 Create your own Hedwig owl balloons using a black permanent marker! You can attach a Harry Potter party invitation for owl delivery! Plan your own magical Harry Potter-inspired party with these great sources gathered by the crew at Spaceships and Laser Beams. Check out more great magical birthday party ideas.